Carmen’s passion for food is inspired by her Spanish roots where preparing and eating fresh food in the company of family and friends is the norm. This passion led her to study Anatomy and Physiology in order to understand the mechanics of the human body. However, as the body does not exist on its own, she learned Yoga, Meditation, Reiki and other alternative therapies to explore the connection between mind, body and spirit and how food affects our thoughts, behaviour and mood. Carmen has been practising for more than 12 years and her science-based approach helps her identify and address the underlying causes of both physical and psychological imbalances in the body which may be causing symptoms and illness. She specialises in digestive issues and gut health, hormonal imbalances and detoxification. Qualified as a Holistic Therapist from St Mary’s College University (Twickenham, 2002). Diploma in Dietetics. Dietary Educator Certificate. Centre for Nutrition Education & Lifestyle Management (CNELM), December 2008. BSc (Honors) Degree in Nutritional Therapy, University of Westminster (London, 2010). Neurolinguistic Programming (NLP) Practitioner Certificate. Centre of Nutritional and Lifestyle Management (Wokingham, 2010). Metabolic Clean Detoxification Diploma (London, 2013). NLP: Metaprogammes Coaching Certification. The UK College of Personal Development (Swindon, 2014). American Anti-Ageing Association (London, 2014-2015). *As a member of the British Association for Applied Nutrition and Nutritional Therapy, BANT Carmen adheres to the strict code of conduct of the Association, which is that of the CNHC. The aim of Carmen’s practice is to attain the highest standards of integrity, knowledge, competence and professionalism in the practice of Nutritional Therapy. “Finding Irrefutable Health came at the perfect time for me as I was feeling very low and needed an over haul on how to look after myself better with a stressful job and busy family life. Carmen Martinez Vidal is my nutritionist, she is very knowledgeable, has given me great advice and is helping me fix some ongoing health issues. Carmen has also helped me to rethink what I am eating in conjunction with helping me find supplements that have boosted my immune system. Through following her advice and doing the metabolic detox programme I feel much better and have even lost some weight. She has a unique perspective as she is spiritual and non- puritanical in her approach which is very referencing, she is very supportive and inspiring. Not only has she helped me with my health but I look forward to seeing her for our discussions. 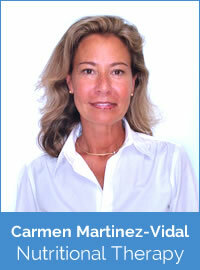 I have recommended Carmen and Irrefutable Health to friends and family.